Handrails - Lichtgitter one of the worldwide leading manufacturers of gratings - Gratings made of steel, gratings made of stainless steel, gratings made of aluminium, GRP-gratings, gratings fpr sun protection, gratings for coverings, perforated metal planks, pressure-locked gratings, forge-welded gratings. 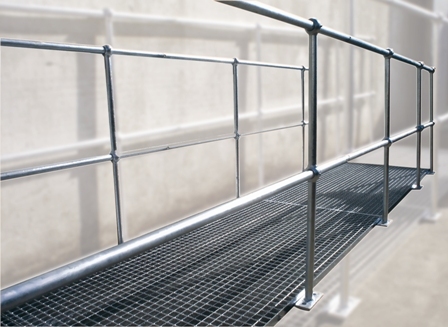 Handrails are used in every type of industry; for platforms, stairways, towers, danger zones and where protection is required against moving and stationary machines. - the system is flexible, allowing repairs, extensions and modifications to be made at low cost.